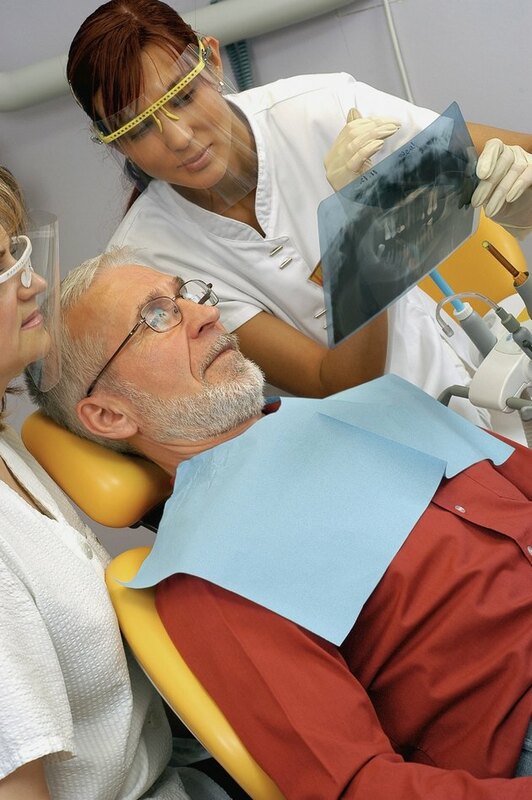 If you have periodontal, or gum, disease, you are not alone. Periodontal disease affects approximately 75 percent of adults over age 30, according to the Ontario Dental Hygienists' Association. The leading cause of tooth loss, periodontal disease begins with an accumulation of plaque -- a sticky deposit of mucus, food particles and bacteria -- that adheres to your teeth at the gum line. While the need exists for further study to substantiate its efficacy, herbalists claim that the turmeric may help reduce periodontal disease. Consult your dentist, however, before self-treating. Turmeric, a member of the ginger family, lends itself as a distinctive yellow-orange spice for cooking. It also has a lengthy history in Ayurvedic and Chinese medicines as a remedy for minor digestive tract, liver, gallstone, menstrual and inflammatory problems. The plant reaches heights of 3 feet and produces spikes of yellow flowers and pairs of lance-shaped leaves that sprout from a fleshy rhizome, or root. Its rhizome contains an orange pulp, the source of turmeric's medicinal value. Periodontal disease, a disorder of the tissues that support your teeth, starts with gingivitis. During this early stage of the disease, symptoms include bad breath, minor pain, and swollen and inflamed gums. If left unchecked, gingivitis can result in a destructive gum and bone disease called periodontitis that further affects your gums and bones. Gums become discolored, recede and easily bleed. In time, tooth sockets become so eroded that teeth loosen and fall out or must be extracted. Commonly caused by poor oral hygiene, periodontal disease can also result from vitamin deficiency, certain medications, glandular disorders and blood diseases. Additionally, ODHA warns that the disease can increase your risk of stroke, heart disease, diabetes, respiratory diseases and other health issues. Turmeric contains curcumin, a key constituent known for its antioxidant and anti-inflammatory effects. Turmeric relieves pain and inflammation linked with gum disease by preventing the action of a gene that creates gum-irritating chemicals, according to certified nutritional consultant Phyllis A. Balch. This deprives bacteria of a site to grow, aiding in the relief of bad breath and periodontal disease. In a 1998 issue of "The Herb Quarterly," Karta Purkh Singh Khalsa, a member of the governing council of The American Herbalists Guild, claims that turmeric mouth packs work exceptionally well for periodontal disease. To prepare a gum pack, wet a pinch of turmeric powder in water or vitamin E oil and apply it nightly to the affected areas. You can also roll the paste into gauze and tuck it in your mouth. While generally recognized as safe, large doses or routine use of turmeric may induce stomach upset. Children, pregnant and nursing women, women undergoing chemotherapy for breast cancer, people with congestive heart problems and others suffering with gastritis, gallstones, diabetes and blood-clotting disorders should not use turmeric. Avoid the herb if you have a history of fertility problems.